Water expert Ma Jun tells us why China’s fragile water resources from sucking the life out of China’s economy., Water expert Ma Jun tells us why China’s fragile water resources from sucking the life out of China’s economy., Water expert Ma Jun tells us why China’s fragile water resources from sucking the life out of China’s economy. Unsustainable water supply in densely populated North. Massive urbanisation & resource-intensive growth: 60% of China’s rivers & lakes unsuitable for human contact. Gov’t goal of slashing water intensity per unit of GDP by 60% by 2020. Water challenges are not a new phenomenon in China but the scale and persistence of China’s latest water crisis make it unique. Urgent action is needed to prevent the exploitation and abuse of China’s fragile water resources from sucking the life out of China’s economy. The prime reason for China’s water shortage is simply that China does not have much of the stuff relative to its population. With 6% of the global water resources, China supports 22% of the world’s population. The center of this mismatch is the alluvial plain of the Yellow, Huai and Hai Rivers. Known as the North China Plain, this region contains nearly 35% of the country’s population and nearly 40% of its arable land, but has less than 8% of its water resource. More than any other issue, the unsustainable water supply in the densely populated North China Plain poses the biggest threat to China’s economic development. Water is needed to irrigate crops to feed hungry city dwellers, to cool power stations and iron smelters, and to flush hundreds of millions of lavatories. For decades, the region depended on tapping underground aquifers to quench growing demand – but a precipitous drop in the water table means pumping is getting increasingly difficult and costly. An equally crucial reason for the water shortage lies in the fact that water that should be available is often too filthy to use. Massive urbanisation and resource-intensive growth over the past 30 years brought a corresponding increase in the discharge of pollutants, thanks to the overuse of chemical fertilisers, mass industrialisation and inadequate wastewater treatment. Today, official data shows that around 60% of the monitored sections of China’s rivers and lakes is unsuitable for drinking or human contact, while up to 90% of the shallow groundwater in cities is contaminated with organic and inorganic pollutants. This explains why many of China’s 400 water-scarce cities are located in the wet south including the Yangtze River Delta and the Pearl River Delta. Part of the problem is that industry has never been forced to pay for its ecological costs, as the government keeps water prices artificially low to attract and retain investors. Therefore, many of the world’s water-guzzling industries that set up in the region do not have an incentive to adopt water recycling technologies. According to the World Bank’s “Cost of Pollution in China” study, published in February 2007, the water crisis already costs China about 2.3% of annual GDP. 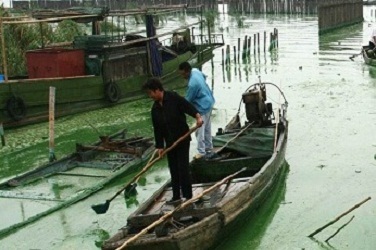 Similar estimates were made by the former State Environmental Protection Administration when its Green GDP report concluded that water pollution in 2004 cost RMB 286 billion, or 1.8% of total GDP, which is more than any other type of pollution. Policy makers have pledged to strengthen environmental protection, but the challenge is translating words into action. There is a growing consensus in China that environmental problems cannot be blamed solely on the country’s comparatively low level of development and lack of technology. Weak administrative regulation, the low price of water and a lack of public concern over corporate environmental behaviour all act as disincentives to more efficient water use and better wastewater management. China has imported environmental rules and discharge standards from developed economies, but legal enforcement of these regulations remains weak. Industrial planning is dominated by local officials and developers, which inevitably leads to compromises over environmental requirements. Poor monitoring, weak enforcement via the courts and low fines frequently mean that the cost of a violation is significantly lower for enterprises than the cost of compliance. The central government is also forcing industries to ramp up water efficiency. China’s water intensity remains high. Boosting efficiency in industry, which now swallows one-quarter of the available water resource, is a vitally important first step. In February, the Ministry of Water Resources announced a goal of slashing water intensity per unit of GDP by 60% by 2020. The challenge remains where to find the driving force for such vast improvement. The key to transforming this sorry situation may be public pressure. A series of major toxic spills and pollution incidents have increased public awareness. Public concern over high-risk projects – especially in wealthier provinces, where local residents can afford to demand a higher quality of life – is likely to grow. The emerging trend for major corporate citizens to collaborate with environmental NGOs in responsible supply chain management brings a major new source of incentives in China’s water pollution control efforts. China’s policy makers have no choice; using water more efficiently will soon become a matter of survival. By 2030, when China’s population peaks at 1.6 billion, total water demand is forecast to reach 700 -800 billion cubic meters. That will leave total water usage perilously close to matching the country’s total usable water resource, once ecological demands are taken into account. If drastic efficiency gains are not made within the next 20 years, China risks seeing its economic miracle literally dry up. Ma Jun was named as one of the 100 most influential persons in the world by TIME magazine in 2006. He is well known for his book, China’s Water Crisis released in 1999, which has been compared to Rachel Carson’s Silent Spring. He directs the IPE (Institute of Public and Environmental Affairs), which developed China’s first public database on air and water pollution. How Green is This Blue Gold?